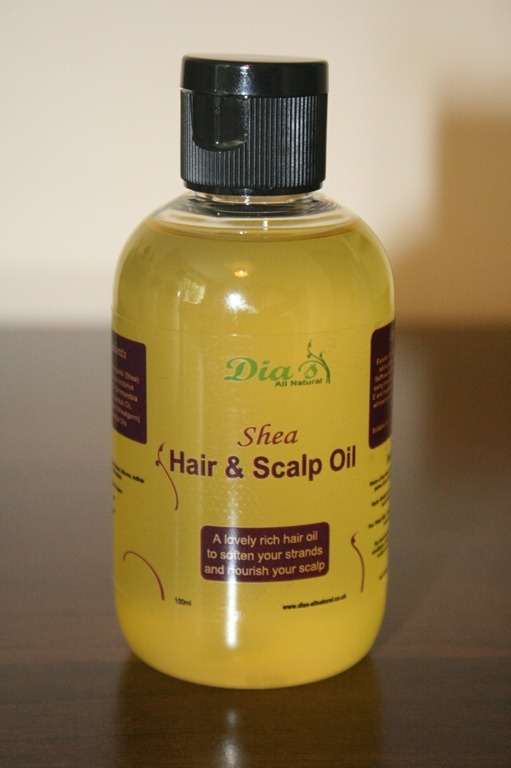 Dia’s Shea Hair & Scalp Oil – Out Now! Dia’s – All Natural Shea Hair & Scalp Oil is now available to order. It’s a Lovely rich hair oil that will soften and nourish your strands. Excellent for sealing in moisture, adding extra sheen and maintaining a healthy scalp. Shea Oil has been mixed with Safflower, Jojoba and Wheatgerm Oils to create a hair loving blend that’s naturally high in Vitamin E & essential fatty acids. For more information and to order yours, click HERE. I personally love Shea Oil. It’s not a very common oil and it’s not easily available which is why i wanted to make it more accessible to everyone. It’s a wonderfully thick oil that reminds me of castor oil in consistency and is a great alternative, although it’s not as ‘sticky’ and is easier to spread. A very smooth feeling oil that translates into smooth feeling hair. I find this a very softening oil that leaves my hair feeling great, without being too greasy. You really only need a small amount of it to get the job done because it’s so rich which makes it quite economical. Shea Oil – Made by removing the stearic fatty acid that makes Shea butter solid. What’s left is a rich, thick liquid that possesses all the original properties of Shea butter, high in vitamins A, E and F, Keratin, Allontoin and Oleic fatty acids. Excellent for thicker, drier hair types, Shea Oil will impart incredible softness without being overly greasy whilst protecting your strands from the harsh natural elements. Safflower Oil – Extremely rich in essential polyunsaturated fatty acids, it is highly beneficial for dry, colour treated or permed hair. When applied to the scalp, it can dilate the blood vessels, resulting in greater nutrients supplied to the hair follicles through blood circulation and a healthy environment for hair regrowth. It also comprises high levels of Vitamin E, alpha-tocopherol and phytosterols. Jojoba Oil – Organic, unrefined & cold pressed. Is chemically very similar to human sebum and promotes healthy hair and scalp. Is antibacterial and can help soothe a dry, irritated scalp. Excellent used to lock in moisture and is great for all hair types. Wheatgerm Oil – Cold pressed. A highly rich oil full of vitamins E, A and D. Also very high in protein and lecithin. Will soften and strengthen your strands and nourish your scalp. Essential Oils – Makes it smell nice and includes Rosemary essential oil to stimulate the scalps circulation and encourage growth. Delaiah’s Microlocs: 1 Year Locaversary!!! Delaiah's Microlocs: 1 Year Locaversary!! !